And there was (day)light. This could be the motto of Day 7 which saw an increased activity of US tactical aircraft from the early morning: quite a change if we think that, since the beginning of Odyssey Dawn, American tacair had flown almost only at night. The reason could be the following: since USAFE F-15Es and USMC AV-8Bs are involved in the “civilian protection” task (hence, they strike ground targets, see yesterday debrief for more info) they operated at night and at higher altitudes until air power of the coalition (almost) completely cancelled the Libyan air defences reducing the SAM and MANPADS threat to the point that even A-10s and AC-130U gunship 4SOS/16SOW could be deployed to the theatre, with the latter performing the first missions into the Libyan territory right after their arrival in Sigonella. SEAD missions were intensified in the morning, with multiple Wild Weasel flights of both F-16s and EA-18G Growlers out of Aviano airbase, probably securing the airspace for those coalition aircraft that attacked Sabha airbase, where Gaddafi’s forces were reported to be killing locals civilians. In spite of the amount of SEAD missions flown in the Libyan airspace, no HARM was reported to be fired by the three SEAD platform available in theatre: F-16CJs of the 480FS/52FW, the EA-18Gs of the USN VAQ-132 (both at Aviano), and the Tornado ECRs of the 155° Gruppo/50° Stormo of the Italian Air Force, deployed to Trapani. Bombers moved in the afternoon towards the town of Misratah, where allied planes hit loyalist in the outskirts. 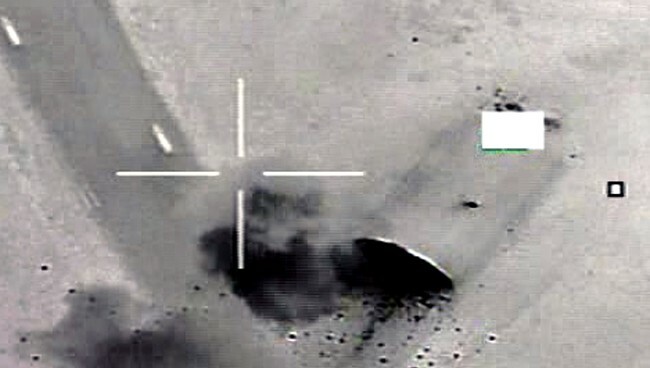 French aircraft carried out several strikes in the region and according to the French MoD, pending a more accurate battle damage result (BDA), initial observations would indicate the destruction on the ground at Misratah of at least five Soko G-2 Galeb combat planes and at least two combat helicopters MI-35 who were about to conduct operations in the region. Needless to say, in spite of the various news reports claiming “7 aircraft shot down” or “Gaddafi’s war planes downed”, these can’t be considered air-to-air victories; what is somehow surprising is that the aircraft were “about to conduct operations in the region” considering the number of coalition aircraft enforcing the No-Fly Zone and the immediate consequences of any attempt to use them to attack rebel forces or simply to disperse them to other bases. 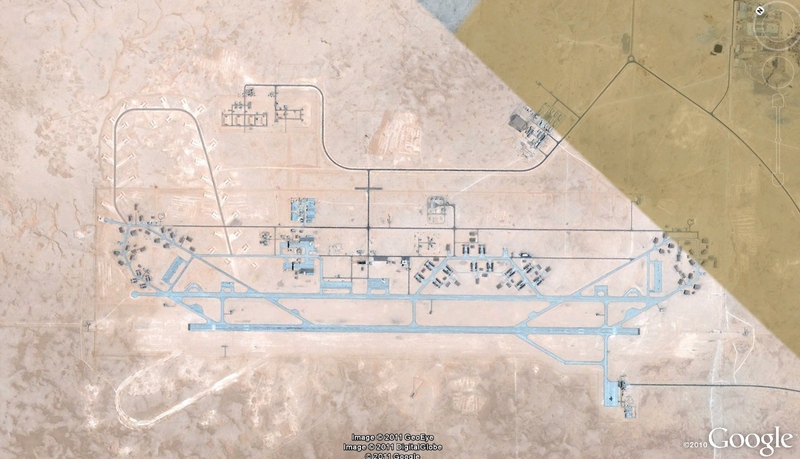 I’m curious to know where if they were parked, as usual, next one another in the large apron located next to the RWY15 threshold: in this case, an LGB could destroy or at least damage more than one aircraft at a time. Unsheltered aircraft are an easy target for PGMs and, in some cases also for guns, while aircraft recovered inside HAS (Hardened Aircraft Shelters) must be hit individually, requiring a large amount of sorties and time. 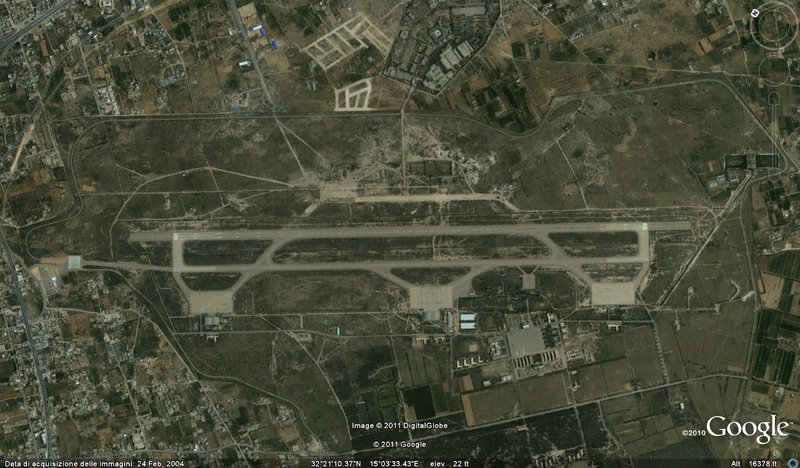 The images below let you compare Misratah airport to Al Jufra, the latter with the typical dispersed HAS recoveries, requiring multiple strikes. 1) 20 French aircraft, supported by four tankers and one E-3F for Airborne Early Warning, were involved in both air defence and ground attack missions. Flown sorties as follows: 2x Rafale air patrols, 2x Mirage 2000D + Rafale patrols and 2x joint patrols with Super Etendard from Charles de Gaulle aircraft carrier. A second Qatar Emiri Air Force sortie was flown by the 2 QEAF Mirage 2000-5 deployed to Souda Bay airbase that performed a joint surveillance of Libyan airspace together with 2 FAF Mirage 2000s. 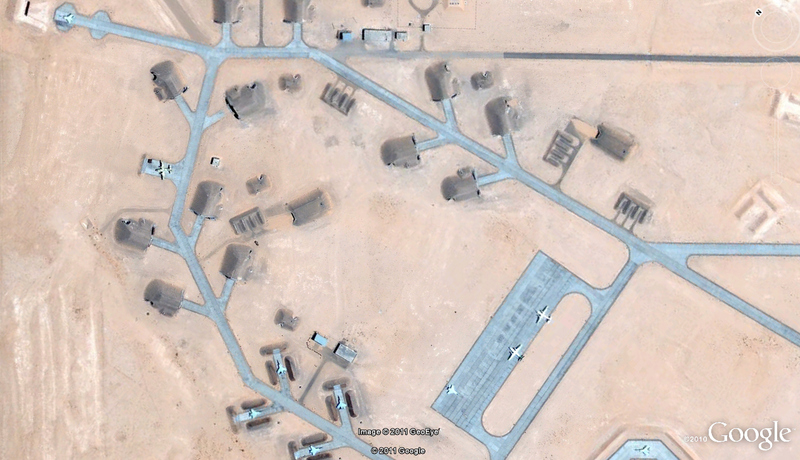 2) The 6 UAE Air Force F-16s expected to arrive in Decimomannu didn’t show up yet. 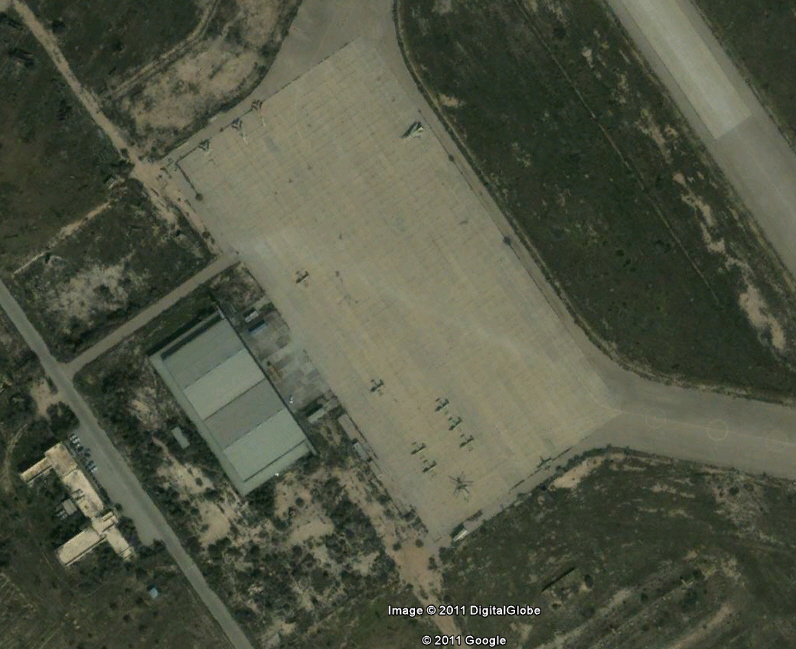 They should make a stopover in Souda Bay, before landing in the Sardian airbase. In the meanwhile, at Deci, the RNlAF F-16 are preparing for the first missions of Odyssey Dawn. An air bridge, involving an Antonov AN124 and a KDC-10 of the KLu is bringing various equipements and supplies to Cagliari Elmas airport since Deci taxiways are too small to accomodate the large cargo plane. 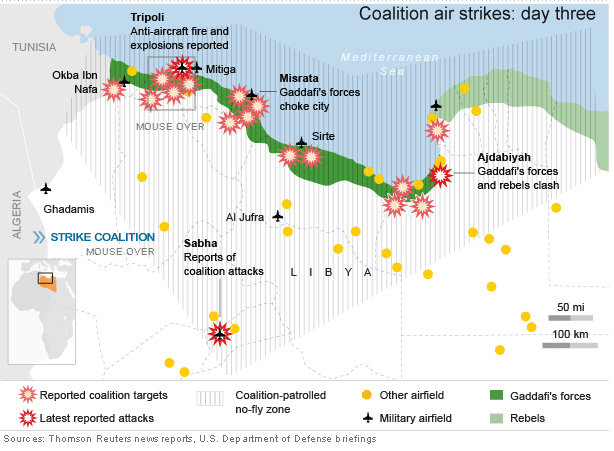 4) US intelligence reports suggest that Gaddafi’s forces have placed the bodies of people they have killed at the sites of allied air strikes so they can blame the coalition for collateral damages, Secretary of Defense Robert Gates said in a television interview on Saturday. 5) Up to 11 refueling areas were established over the Mediterranean Sea to support Operation Odyssey Dawn. Even if the tactical management of these is performed by the AWACS E-3s performing airspace management, the duty of bringing the tankers to/from their airbases to the AAR racetracks through the Malta FIR is performed by Malta ATC that has been intensively working to “serve” all the operative traffic flying to/from the Libyan airspace deconflicting it with the scheduled services operating on Malta International Airport and with the civilian flights crossing the Mediterranean Sea. 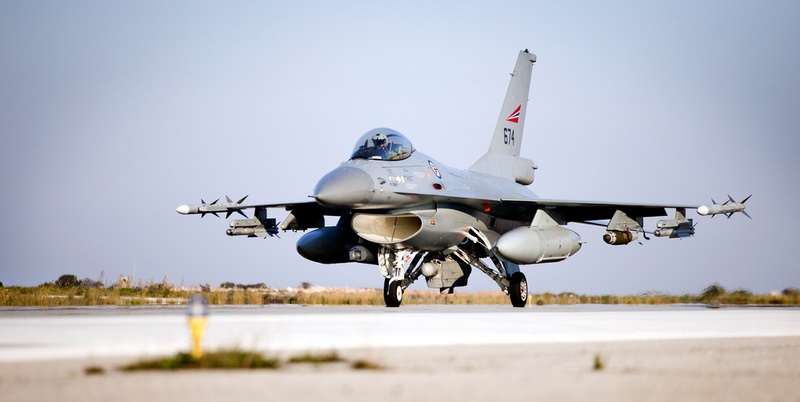 The intense work of the Maltese controller brings me to mind the impact that Allied Force operation in Serbia, with hundreds combat aircraft based in Italy and crossing the Italian airspace, had on both the civil air travel and military operations in Italy in 1999. I suggest you reading this detailed article on the subject: Military ATCC during Allied Force.